Our sages tell us that, originally, all trees bore fruit, as will also be the case in the Era of Moshiach. A fruitless tree is a symptom of an imperfect world, for the ultimate function of a tree is to produce fruit. If "man is a tree of the field" (Deuteronomy 20:19) and fruit is the tree's highest achievement, there are seven fruits that crown the human and botanical harvest. 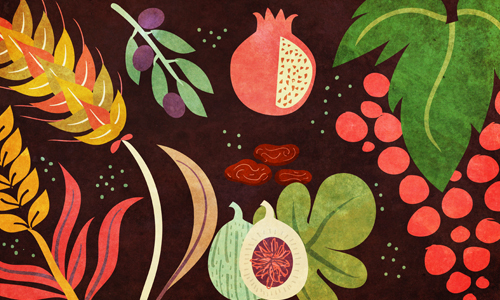 These are the seven fruits and grains singled out by the Torah as exemplars of the Holy Land's fertility: wheat, barley, grapes, figs, pomegranates, olives and dates. The 15th day of the Hebrew month of Shevat is the day designated by the Jewish calendar as the New Year for Trees. On this day, we celebrate the trees of G‑d's world, and the tree within us, by partaking of these seven fruits, which typify the various components and modes of human life. The Kabbalistic masters tell us that each and every one of us has not one, but two souls: an animal soul, which embodies our natural, self-oriented instincts; and a G‑dly soul, embodying our transcendent drives—our desire to escape the I and relate to that which is greater than ourselves. As its name implies, the animal soul constitutes that part of ourselves that is common to all living creatures: the instinct for self-preservation and self-perpetuation. But man is more than a sophisticated animal. There are qualities that are unique to us as human beings—the qualities deriving from our G‑dly soul. The point at which we graduate beyond the self and its needs (How do I survive? How do I obtain food, shelter, money, power, knowledge, satisfaction?) to a supra-self perspective (Why am I here? What purpose do I serve?) is the point at which we cease to be just another animal in G‑d's world and begin to realize our uniqueness as human beings. This is not to say that the animal self is to be rejected in favor of the divine-human self. These are our two souls, both of which are indispensable to a life of fulfillment and purpose. Even as we stimulate the divine in us to rise above the merely animal, we must also develop and refine our animal selves, learning to cultivate the constructive aspects of selfhood (e.g., self-confidence, courage, perseverance) while weeding out the selfish and the profane. In the Torah, wheat is regarded as the mainstay of the human diet, while barley is mentioned as a typical animal food (cf, Psalms 104:15 and I Kings 5:8. See also Talmud, Sotah 14a). Thus, "wheat" represents the endeavor to nourish what is distinctly human in us, to feed the divine aspirations that are the essence of our humanity. "Barley" represents the endeavor to nourish and develop our animal soul—a task no less crucial to our mission in life than the cultivation of our G‑dly soul. Wheat and barley, the two grains among the Seven Kinds, represent the staples of our inner make-up. Following these come five fruits—appetizers and desserts on our spiritual menu—which add flavor and zest to our basic endeavor of developing our animal and G‑dly souls. The first of these is the grape, whose defining characteristic is joy. As the grapevine describes its product in Yotam's Parable (Judges 9:13), "my wine, which makes joyous G‑d and men." Joy is revelation. A person ignited by joy has the same basic traits he possesses in a non-joyous state—the same knowledge and intelligence, the same loves, hates, wants and desires. But in a state of joy, everything is more pronounced: the mind is keener, the loves deeper, the hates more vivid, the desires more aggressive. Emotions that ordinarily show only a faint intimation of their true extent now come out into the open. In the words of the Talmud, "When wine enters, the concealed emerges." A joyless life might be complete in every way, yet it is a shallow life: everything is there, but only the barest surface is showing. Both the G‑dly and the animal souls contain vast reservoirs of insight and feeling that never see the light of day because there is nothing to stimulate them. The grape represents the element of joy in our lives—the joy that unleashes these potentials and adds depth, color and intensity to everything we do. We might be doing something fully and completely; we might even be doing it joyously. But are we there? Are we involved? Involvement means more than doing something right, more than giving it our all. It means that we care, that we are invested in the task. It means that we are affected by what we are doing, for the better or for the worse. The fig, the fourth of the Seven Kinds, is also the fruit of the Tree of Knowledge of Good and Evil—the fruit which Adam and Eve tasted, thereby committing the first sin of history. As Chassidic teaching explains, knowledge (daat) implies an intimate involvement with the thing known (as in the verse, "And Adam knew his wife"). Adam's sin derived from his refusal to reconcile himself with the notion that there are certain things from which he must distance himself: he desired to intimately know every corner of G‑d's world, to become involved with every one of G‑d's creations. Even evil, even that which G‑d had declared out of bounds to him. Adam's fig was one of the most destructive forces in history. In its equally powerful constructive guise, the fig represents our capacity for a deep and intimate involvement in our every positive endeavor—an involvement which signifies that we are one with what we are doing. "Your lips are like a thread of scarlet," extols King Solomon in his celebration of the love between the Divine Groom and His bride Israel, "your mouth is comely; your temple is like a piece of pomegranate within your locks" (Song of Songs, 4:3). As interpreted by the Talmud, the allegory of the pomegranate expresses the truth that, "Even the empty ones amongst you are full of good deeds as a pomegranate [is full of seeds]." The pomegranate is not just a model for something that contains many particulars. It also addresses the paradox of how an individual may be empty and, at the same time, be full of good deeds as a pomegranate. The pomegranate is a highly compartmentalized fruit: each of its hundreds of seeds is wrapped in its own sac of pulp and is separated from its fellows by a tough membrane. In the same way, it is possible for a person to do good deeds—many good deeds—yet they remain isolated acts, with little or no effect on his nature and character. He may possess many virtues, but they do not become him; he may be full of good deeds, yet he remains morally and spiritually hollow. If the fig represents our capacity for total involvement and identification with what we are doing, the pomegranate is the fig's antithesis, representing our capacity to overreach ourselves and act in a way that surpasses our internal spiritual state. It is our capacity to do and achieve things that are utterly incompatible with who and what we are at the present moment. The pomegranate is hypocrisy in its noblest form: the refusal to reconcile oneself to one's spiritual and moral station as defined by the present state of one's character; the insistence on acting better and more G‑dly than we are. For most of us, life is synonymous with struggle. We struggle to forge an identity under the heavy shadow of parental and peer influence; we struggle to find a partner in life, and then we struggle to preserve our marriage; we struggle to raise our children, and then struggle in our relationship with them as adults; we struggle to earn a living, and then struggle with our guilt over our good fortune; and underlying it all is the perpetual struggle between our animal and G‑dly selves, between our self-oriented instincts and our aspiration to transcend the self and touch the Divine. The olive in us is that part of ourselves that thrives on struggle, that revels in it, that would no more escape it than escape life itself. Just like an olive, say our sages, which yields its oil only when pressed, so, too, do we yield what is best in us only when pressed between the millstones of life and the counterforces of a divided self. As the fig is countered by the pomegranate, so, too, is the olive in us contrasted by our seventh fruit, the date, which represents our capacity for peace, tranquility and perfection. While it is true that we're best when we're pressed, it is equally true that there are potentials in our soul that well forth only when we are completely at peace with ourselves—only when we have achieved a balance and harmony among the diverse components of our souls. Thus the Psalmist sings: "The tzaddik (perfectly righteous person) shall bloom as the date palm" (Psalms 92:13). The Zohar explains that there is a certain species of date palm that bears fruit only after seventy years. The human character is comprised of seven basic attributes, each consisting of ten subcategories; thus, the tzaddik's blooming after seventy years is the fruit of absolute tranquillity—the product of a soul whose every aspect and nuance of character has been refined and brought into harmony with oneself, one's fellow and one's G‑d. While the olive and date describe two very different spiritual personalities, they both exist within every man. For even in the midst of our most ardent struggles, we can always find comfort and fortitude in the tranquil perfection that resides at the core of our souls. And even in our most tranquil moments, we can always find the challenge that will provoke us to yet greater achievement. Very enlightening for anyone pursuing the nature of man as it relates to biblical teaching. Someone needs to make an internet site compiling all this sort of biblical/ spiritual teaching for seekers of such information. Fascinating! It's also very revealing about human nature. Re: Attributes While that connection is indeed made in the Kabbalah (see Likkutei Torah and Sefer Likkutim of the Arizal and Likkutei Levi Yitzchak Iggeret Hakodesh p. 367), I do not believe the intent in the word "attributes" in the title referred to the seven midot we normally speak about. Rather, these are seven components in the way we live our life. Put no image before me I would perhaps add Tzvi, if I may, that G-d injected his spirit into adam. So where is now that spirit - but in the core of man? Hence the ancient and universal saying, applauded by both Jewish and Greeks together: Man, know thyself. You will find that the essence of all living thing, is one and the same. That which is beyond words and beyond physical contructs. for Jade All human beings are in the image of Adam, the first man. He was created "in the image of G_d"--meaning that he had a G_dly soul. So all human beings still have that image within them.